Dr. Brad Elkin received his bachelor’s degree with honors from Washington University in St. Louis, his dental degree from Rutgers School of Dental Medicine with highest honors, and his orthodontic training at Tufts University. Dr. Elkin was named a Top Orthodontist in New Jersey Monthly Magazine’s 2016 survey of New Jersey dentists for the eighth consecutive year. Results of the survey are published in the July 2016 issue. Dr. Elkin was selected as one of "America's Top Dentists" several years in a row by the Consumer Research Council. He is also recognized as a Super Elite Invisalign® Provider, which places him in the Top 1% of all Invisalign providers. He was voted one of NJ Family Magazine's "Kids' Favorite Docs" for past several years. Dr. Elkin is a member of the American Association of Orthodontists, has served as president of Mercer Dental Society in 2009, and was elected to Omicron Kappa Upsilon — the national dental honor society. He is also a member of the Schulman Study Group, a nationally recognized association of prominent orthodontic practices. 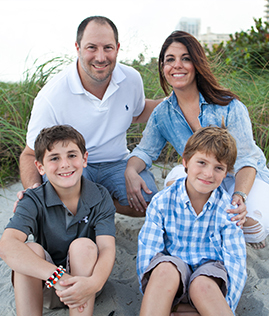 Outside of work, Brad loves to play tennis and spend time with his wife Liza and twin sons, Sam and Justin.